Are you seeking an education with a strong return on investment that will set you on the right career path? The Master of Science in Analytics (MSA) is a cost-effective program with rapid time to completion and a proven track record. Job placement rates have exceeded 90-percent at graduation in each of the last eleven consecutive years. Benchmark studies of starting salaries and placement rates show MSA student outcomes rival, if not surpass those of comparable programs at other leading universities. The ROI payback period is estimated to be 20 months on average. Professional development and career services are an integral part of the MSA experience, including assistance with resume writing, interview and presentation skills, and professional networking. All career services are staffed and coordinated by the Institute and provided exclusively to MSA students. Dozens of employers visit the Institute each semester with the sole purpose of interviewing our students. 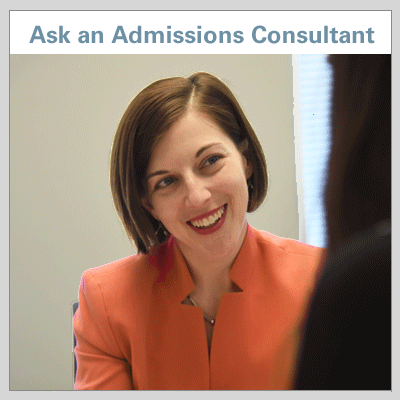 Most job interviews are conducted on campus and arranged with the assistance of the Institute. 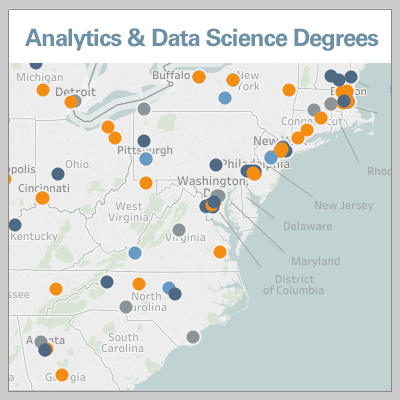 If becoming a data scientist is your aspiration, let your choice of where to study be a data-driven decision. The Institute was founded on a principle of transparency in providing prospective applicants with relevant data on student outcomes. We believe in letting the numbers speak for themselves. The employment report is a complete and carefully curated census of our annual placement results. It is published promptly upon graduation each year. We invite you to download the employment report and to inquire with any questions you may have about it. Bold denotes employers that succeeded in hiring one or more candidates, and (*) for employers that hired more than one candidate. The list does not include agencies of the federal government making conditional offers of employment. Notes: Data with respect to salaries and bonuses are self-reported by graduates (without anonymity) and whenever possible verified by employers in cases where placement is arranged by the Institute (i.e., most candidates). Three graduates were international Fulbright Scholars and were required to return to their home countries; one will remain temporarily in the U.S. to work before returning home. All other job placements are full-time paid positions. 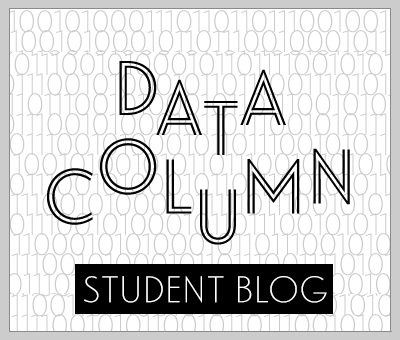 Data are made public here to guide prospective students and employers. Annual base salary figures do not include signing bonuses, relocation allowances or other forms of one-time compensation guaranteed upon signing. Contracts, conditional job offers (i.e., those requiring security clearance prior to employment) or other public sector employment are not included in salary data (n=3). As a STEM-qualified degree, international MSA graduates are eligible for Optional Practical Training (OPT). DISCLAIMER: The Institute has a proven track record for placing graduates in the analytics profession, but it does not under any circumstance offer a guarantee of employment upon completion of the MSA degree. Here’s a sample of where our graduates are employed today. To learn more about the success of our community of graduates, see the annual MSA Alumni Report. Below each circle represents a graduate by class year. Connected circles represent a group of graduates with a common demographic property. Changing the demographic to visualize in the pull-down menu will rearrange the circles in the graph to match the demographic distributions. Hold and drag circles to change their positions. Use the calendar bar to select a particular class year or a span across multiple years. Having 3 or more years of professional work experience. Legal residency in North Carolina prior to entry. Institute directly involved in the student’s job placement. The number of first-round job interviews with employers. The number of job offers received. Students accepting a job offer prior to graduation date. Major types of job positions graduates accept for employment. Major industry segments in which graduates are employed. Geographic distribution of employment by U.S. Census region. Annual base starting salary (not including signing bonus). One-time compensation for signing, including relocation packages. Starting salary adjusted for inflation (2018 dollars). 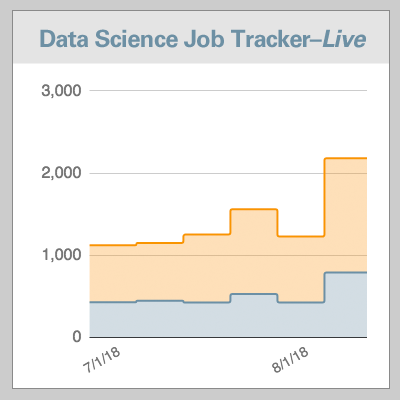 The following chart provides real-time data on the number of job postings in the U.S. for entry-level data scientists with salaries of $80,000 or higher posted in the past 30-days. 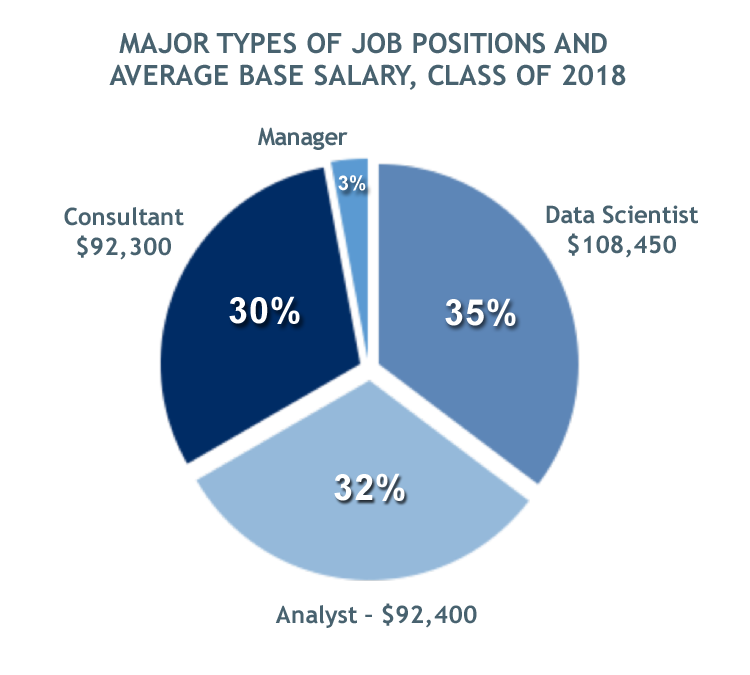 While “data scientist” job openings are only a subset of a larger category of positions for which our students typically qualify (download the MSA Employment Report for more details), the data may provide a good barometer of the overall employment conditions for analytics professionals. It’s to be expected the trend in job postings will have seasonality. Employment reports for each graduating class provide additional information about hiring employers and types of positions filled.